Check for radio stations in your area. Thanks for listening to Radio Disclosure! 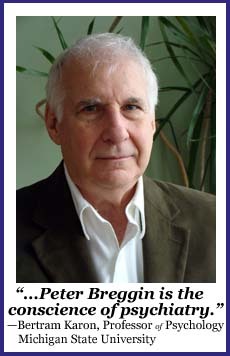 Peter R. Breggin M.D. conducts a private practice of psychiatry in Ithaca , New York , where he treats adults, couples, and families with children. He also does consultations in the field of clinical psychopharmacology and often acts as a medical expert in criminal, malpractice and product liability suits. Before moving to Ithaca in November 2002 he was in practice for nearly thirty-five years in Washington , DC and Bethesda , Maryland . He has written dozens of scientific articles and many professional books, including Medication Madness: The Role of Psychiatric Drugs in Cases of Violence, Suicide and Crime (2008), and is on the editorial board of several journals. In 2010 Dr. Breggin and his wife Ginger formed a new organization that continues their emphasis on bringing professional and laypersons together to share their concerns about the hazards of contemporary biological psychiatry while promoting more caring and empathic approaches to personal conflict and suffering. The new organization will sponsor an annual meeting each April in Syracuse, New York (empathictherapy.org). - New photographs of extraordinary formations before the September 11, 2001 horror, including the Chilbolton, England "face and binary code."